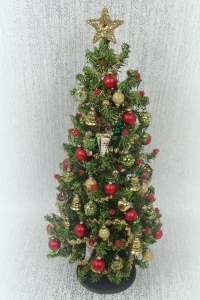 Stunning luxury dollhouse Christmas tree in tradition Victorian colours of red, green and gold. This stunning little tree contains hundreds of painstakingly handmade and decorated baubles that sway and twinkle upon movement. This beautiful little tree would equally suite 24th scale as well as 12th scale dollhouses. This wonderful little tree contains Victorian Christmas cones, golden bells, jewelled golden hearts gold plated baubles, chartreuse green and gold recessed and jewelled baubles to name but a few, gold plated garland and topped off with a jewelled sparkly golden star.